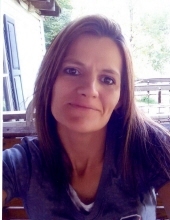 Tanya Lynn Goble, age 39 of Topmost, Kentucky, passed away on Thursday, March 14, 2019 at Pikeville Medical Center, Pikeville, Kentucky. She was born December 21, 1979 in Prestonsburg, Kentucky to the late Margie Rebecca Yates. She is survived by her Children: Blake, Richard, Santana, Kaitlyn, Makayla, Brianna & Tyesha; Boyfriend: Jackie Hall of Topmost, Kentucky; Brothers: Mitchell Goble of Winchester, Kentucky, Anthony Goble of Beattyville, Kentucky& Michael Goble of Freemont, Ohio Sisters: Jeanina Patton of Winchester, Kentucky & Melissa Ebling of Mousie, Kentucky. Along with her mother she was preceded in death by her Brother: Robert Goble; Sister: Jeannie Goble. She will be missed by all that knew and loved her. "Email Address" would like to share the life celebration of Tanya Lynn Goble. Click on the "link" to go to share a favorite memory or leave a condolence message for the family.